I’ve been very fortunate to work in the hospitality business for over 20 years and to get to travel extensively during that time. I love a great cocktail and have gotten to try some fantastic ones in all kinds of bars. If you also enjoy going out for a drink, here’s how to have the best time at a cocktail bar… and how to be a good guest the staff will appreciate, too. First things first. Sit at the bar, right up front! Making cocktails is an art, so grab a front row seat and watch all the action. And while you’re at it, say hello to your bartender! It’s a polite way to get them to notice you. Then have a quick look around. Check out the back bar. What kind of spirits do they focus on? Is it a bourbon theme? Gin? Do they barrel age (a big trend right now)? Look for names and products you’ve never heard of before. Do they have a huge chunk of ice that they carve for certain drinks? Ask which ones they use it for, and think about ordering one of those. It’s a cocktail, not a big commitment. Want to know how to tell right away that you’re in a great bar? You may find a few good cocktail spots with televisions, but the focus should be on the bartenders, conversation and your drink, not sports or news. My opinions on bar décor and layout are a story for another day… but generally, a TV is a big downer. Now, take a quick look at the cocktail menu. It says a lot about the experience you are about to have. Are the drinks classics, like Negronis or Manhattans? Do they have crazy ingredients like deer antler and shrubs they make in house? After I get a sense of the space, the bartender and the drink options, I usually order my first cocktail from the menu. I almost always start with something light and refreshing. I’ll watch how my drink is made as well as the other ones being mixed or carried over to a table. People often hesitate to do this because they worry it will be annoying. Nothing could be further from the truth. A great bartender is very proud of their craft. They love to answer questions and tell you what they’re doing and how they’re doing it. If I love the first drink and it’s executed well, that’s when let the bartender take control. When they ask what’s next I let them decide. I ask them what their favorites are. Depending on the answer, I may go for one of those, or I tell them my preferences so they can craft something I will love. It’s important to learn to speak the language of cocktails so you can guide your bartender to make something you will enjoy. Cocktails are broken down into a few basic categories. Shaken drinks are usually more refreshing and not as “spirit forward,” meaning they have other ingredients added. Plus, the process of shaking aerates the drink, which increases the dilution. Along with ice, this helps mellow and blend the flavors. Shaken drinks are sometimes served up (no ice, like a martini) or over fresh ice, any shape or style. An “up” drink will be more powerful as there will be no further dilution, where the flavor of a drink over crushed ice will continue to soften. Now let’s talk flavor profiles. A common one is citrus forward, like with a Spanish-style gin and tonic. Citrus forward cocktails are usually gin-based because of the citrus and other floral elements used in the distillation process. The opposite of citrusy is usually called “boozy.” This style is where the spirit is the core flavor, with other ingredients added to highlight the base spirit - bitters, shrubs, etc. Using these base concepts, the bartender can make a drink you’ll like once they get a little more input from you. Let them know what spirits you like: gin, rum, tequila, bourbon, other? And let them know what you like and don’t like in terms of overall tastes. Do you prefer sweet? Spicy? Hot drinks? Long Island iced teas (though if that’s your thing, Applebee’s may be more your speed)? Now is not the time to be shy. I was in New Orleans for the first time a few months ago and asked some industry friends about some great spots I needed to try. I had a fantastic dinner at the bar at Herbsaint (always sit at the bar and dine whenever you can) and started talking cocktails with the very skilled and fun bartender. After I ordered a Sazerac (I was in New Orleans after all), I let him take over. I had a fantastic experience, learned about some new products I hadn’t seen before and, like I always do, I offer to buy a shot or drink for the bartender. Some can have a drink with you, some can’t, but, making the offer is something you should always do. Most of the time you won’t pay for it and I always let the bartender choose the drink or shot. After chatting for awhile, I asked for another drink, his call. He made me a drink the staff used to drink after work which wasn’t even on the menu. It’s a simple and addictive drink: Reposado Tequila and Campari shaken and poured over ice, then topped with Stiegl Radler, a low- alcohol German grapefruit beer. Well, I still think about that drink all the time and I never would have had it if I hadn’t made a connection with the bartender. Another thing I always do when I travel is ask my bartender what other cocktail bars I need to try. My bartender at Herbsaint sent me to Cure. I had a fantastic experience the next night with a great bartender who after 2 drinks read my mind with what I wanted. In NYC at the NoMad (one of the best bars I have ever been to) I asked our server at dinner where we should go after for drinks and she invited us to join the entire NoMad team at the Ace Hotel’s Breslin Bar after they finished work. Needless to say we had a blast! Be forewarned: hanging out with industry people is not for beginners. 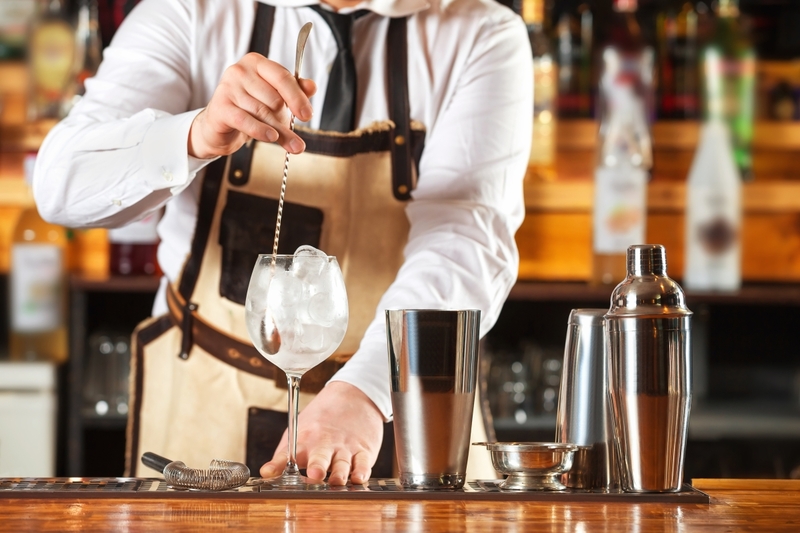 If you follow these simple tips, you will have the best possible experience at a cocktail bar. So make a friend, learn to speak the language, don’t be afraid to let them know what you like, and try a shot of Fernet! Michael Gluckman is a food and beverage industry executive based in Dallas, Texas. Cocktailspy.com RECEIVEs a small commission When you MAKE A purchase through a link on the WEBsite. THIS HAS NO IMPACT ON THE PRICE YOU PAY FOR THE ITEM. © 2017 Lazar Marketing Inc. All Rights Reserved.